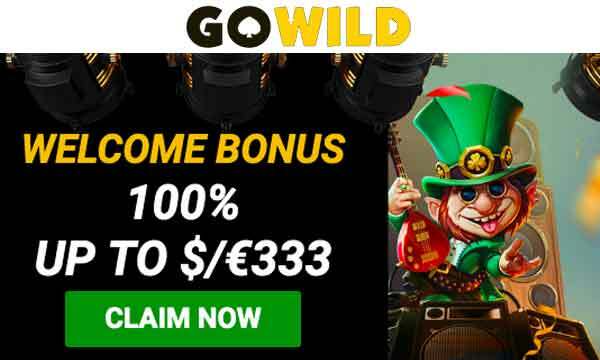 Trada Casino Bonus: Claim 10 No Deposit, No Wager Spins Bonus! Trada Casino Bonus: 10 No Wager No Deposit Spins + 100 Low Wager Spins! Get 10 Free Spins No Deposit No Wager + 100 Low Wager Bonus Spins At Trada Casino! Trada is one of the best online casinos and they are giving you 10 no deposit spins with no wagering requirements. Plus, you can get another 100 low wager bonus spins on first deposit with the full Trada Casino Bonus! At Trada Casino they welcome all new sign ups with a fantastic no deposit bonus. Once you have registered you can claim 10 spins on Wolf Gold. Plus, what’s best of all is that these bonus spins have no deposit and no wagering requirements, so you keep what you win as real cash! If you’ve never played Wold Gold before, you’re in for a treat. It’s produced by Pragmatic Play and is popular with players all over the world. 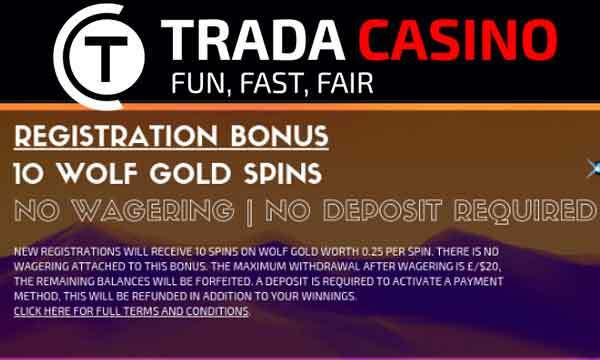 Once you have played through your no deposit bonus there are more spins to be claimed with the full Trada Casino Bonus for new players. 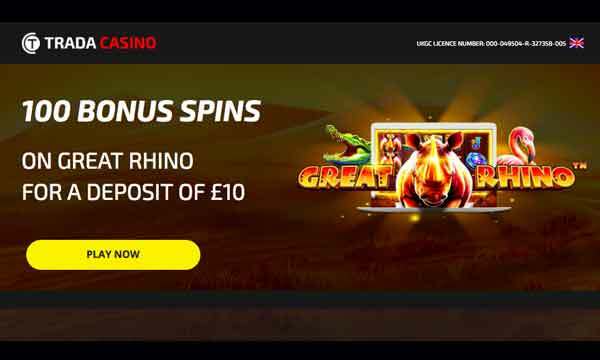 When you make a deposit of just £10 you will be given 100 Low Wager Bonus Spins on another Pragmatic Play game, Great Rhino. These bonus spins are added to your account in one go and have low wagering requirements. So you have a great chance of hitting that big win and not having to play through an unreasonable amount of times. The 10 registration spins bonus does not require a deposit. They also have no wagering requirements. 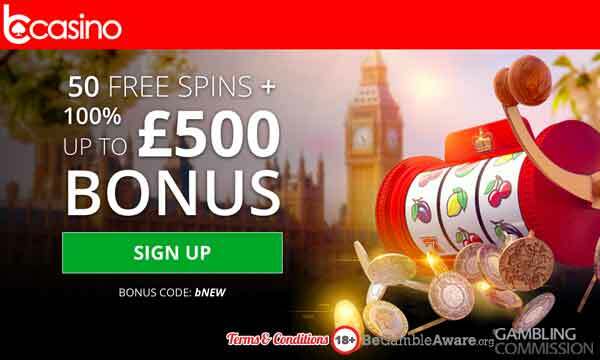 To activate the 100 bonus spins welcome bonus, there is a minimum deposit of £10 required. Wagering on the 100 Great Rhino spins is set at 20x the bonus spins winnings. Slots players can earn cashback bonuses in real time at Trada Casino. Every £70 wagered on slots will automatically unlock cashback of £2. This cashback deal also carries no wagering. After your first deposit, you can also earn 25% cashback on all subsequent deposits when you enter PROMO CODE: CB25. The cashback you earn will never be lost, as it is always carried over into the next period. You can also claim a different bonus every day at Trada. Somply go to the promotions page and select daily bonus. You can then select claim bonus to reveal what bonus is available to you on that day. Trada also operate a VIP Club for their high rollers. This is a members only club but once you’re in, you’ll get the red carpet treatmant and treat you like the VIP you are. 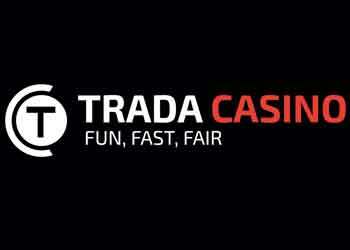 Trada Casino is regarded as one of the worlds best casinos. No gimmicks and no funny business, just a pure fun, fast and fair casino experience. And that is exactly what their strap line is! This motto is clearly seen in the way that they treat their new and regular returning players. 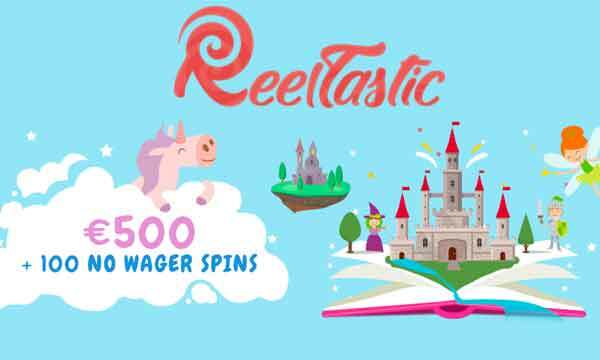 New customers can grab 10 no deposit wager free spins when they register and another 100 low wager spins bonus on first deposit of just £10. Plus, existing players can earn cashback on every deposit and everything they bet with no wagering requirements. All in all, it’s a great place to play. Another reason that why Trada stands head and shoulders above the rest is the fantastic selection of games on offer. Whether you’re in to slots, live casino games, table games or jackpots, they have it all. All of these games are provided by the best software developers so quality is guaranteed. Making deposits and withdrawals is quick and easy too. There’s a number of secure payment systems available to transfer funds including credit/debit card, PayPal, Skrill and Neteller. Trada Casino is regulated by the UKGC. Customer support is available by live chat, email or post. Try out one of the worlds best casinos with 10 no deposit no wager spins at Trada Casino. MustardBet Casino Bonus: Get 2% Cashback On Every Bet – No Wagering!